not just ordinary hockey. hockey on ice, in the NW US hockey on ice is ordinary hockey. Audiences at hockey matches bear more resemblance to (real) football audiences throwing insults at players and referees, there were some entertaining insults thrown around at the match between the Seattle Thunderbirds and the Tri-Cities Americans. Mostly aimed at a Tri-Cities player with the family name ‘Yellow Horn’ on his shirt. Tri cities covers three cities, Richland, Kennewick and Pasco. Near Hanford, Hanford was the nuclear power generator for the Manthatten project, the first full-scale plutonium producing reactor in the world. One Seattle Thunderbirds supporter called out: Yellow Horn, do you glow in the dark? One of the highlights was when my companions explained that the orange rubber-pucks that you could purchase on the way into the ground are for throwing into the sunroof of the car that drives on the ice during the interval. Yeah, you’re pulling my leg right? No? 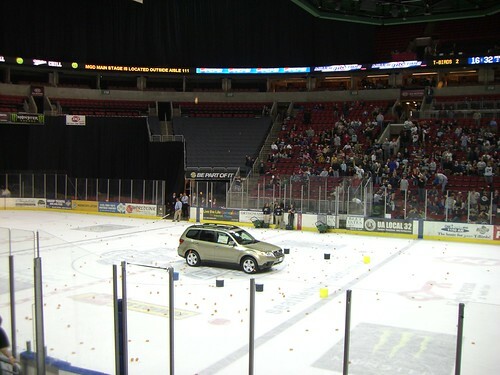 You’re serious, we buy rubber pucks and throw them into the sunroof of a car on the ice rink? And indeed we did just that…. Thankyou to the cultfigurine and cultfigure for escourting me into the wierd and wonderful world of ice hockey. Sadly, Reading doesn’t have its own Ice Hockey team in the UK league, When the season starts in the UK, next September, I’ll have to catch a direct train then bus to the Basingstoke arena, looks like they need a little support, hoorah!. This scribble was published on Friday, April 11th, 2008. You can follow any banter on this scribble with the RSS 2.0 feed. You can share your inspired musings after typing the anti spam word near the bottom of the page. But no Pinging because its too naughty. Your pictures are great. 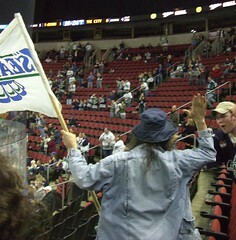 I noticed that you did snap one of the T-birds’ first goal – nicely done!